Here's a little piece of SEO nerdery that affects us all: Google is using Google+ to influence search results in a big way, and brands and media organizations alike have yet to wake up to the reality of it. Search Plus Your World -- the function that prioritizes content from your Google+ connections -- got started a year ago, but Author Rank could have an even bigger effect on search results. It is not officially in effect, but after working on it for seven years (previously called Agent Rank) it's clearly the way forward for Google results. The change is very simple -- Google wants to prioritize content created by verified writers with authority in certain topics in its results. Credibility is what makes Google's search results as efficient and useful as they are. Filtering out the spam was the goal of PageRank, and SEO spammer and linking schemes still found ways around that. So now Google is verifying individual writers through its social network, Google+ with something called Author Rank. Now, if a website has connected its writer accounts with their Google+ accounts, search results show a writer's headshot and byline next to the result for their article. Bylined stories rank higher, and they get more real estate. Most importantly, they return clickthrough rates that are 40 percent greater than normal, according to Greg Boser, President of of SEO agency BlueGlass. It's not just about showing up in Google's results-- it's about getting real estate and clicks. 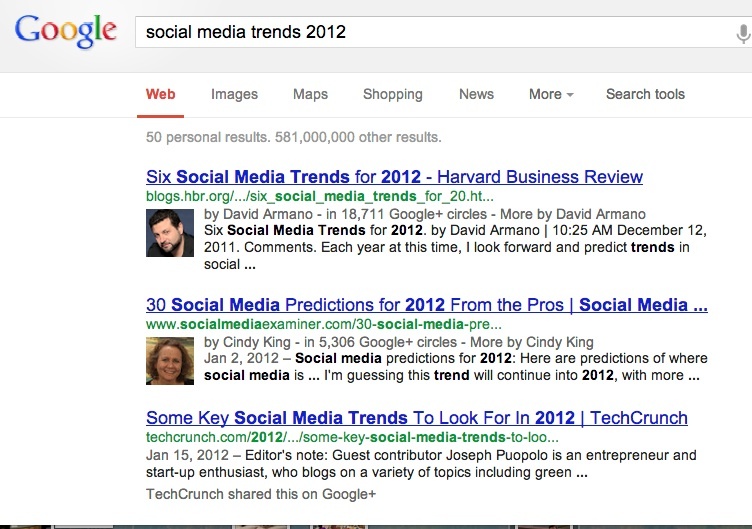 Check out this search I did for "social media trends 2012": The top two results are Author Rank results. The third was shared by TechCrunch on Google+. The two with author pics look more inviting than the third, and even that result was influenced by the fact that I follow the blog on Google+. You could argue that Google is killing its sacred cow in foolish hopes of beating Facebook at the social media game. Or you could argue, as many SEO experts have, that Google is improving its search results with rich, verifiable data. The change goes a long way to eliminate content spam. It's easy to forge links and game PageRank, but not so easy for spammers to forge a personal identity through a Google+ account. Either way it's a product and philosophical change. Google was always about the algorithm, not curation, certainly not curation through something as, well, human as a social network. The emphasis before was about what was on the page not who wrote it. Whether you believe it is good or bad, this change has ramifications for content creators. Brands know they must create content, not just to stay fresh and relevant in organic search results, but to engage their customers and maybe even act as thought leaders in their industries. Most companies don't hire big name journalists for their content marketing --aside from the obvious ethical issues, they can't afford them. It's much easier to hire an anonymous consultant or copywriter to churn out content sans byline. No one cares who those writers are as long as the content they produce is viewed as legit to the almighty Google. Until now, that is, when Google wants those writers to have identities. Google has -- according to many-- spent years tearing down the value of a byline and influence through its algorithm-like ranking mechanisms. And at first, that was good. Search engines could unearth content from sites that were more obscure than those listed in a directory, or those you might not already know. Now, it's reversing that on an individual level. The problems came when low quality sites made a living on gaming the system. This is how we end up with 800 news publications writing high quality stories such as "What time does the Superbowl start?" Even media outlets can't rely on their hard-fought search engine rankings to ensure their stories will wind up on the first page of search results. That's up to the individual writers. In our world of socially distributed content, we know that news coverage is often "bring your own audience." News site homepages don't have a built-in audience anymore --in a twisted way, they often rely on the subject of the story to promote them in order to drive traffic. Even influential writers with thousands of Twitter followers aren't as powerful as they look -- studies show that Twitter users with more than 5000 followers drive less traffic and fewer clickthroughs than those with more modest follower counts. It's actually relatively simple for a publication to connect its writers' bios pages with their Google+ bios, but only four Fortune 100 companies have done so, Boser says. Google doesn't own social networking, but it does own search and email (and surprise! new Gmail signups automatically get Google+ accounts). With Author Rank, it's outsmarting SEO spammers while forcing content producers to use Google+. They may not like it, but the alternative -- risk losing influence, isn't much better.